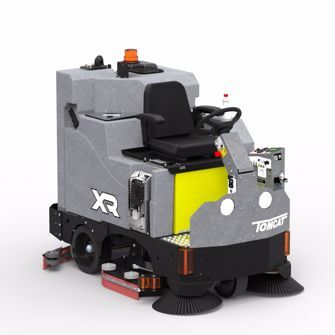 The XR is Tomcat’s largest floor scrubber is the riding XR, with up to 46” cleaning width and a 68-gallon tank, it is no wonder why it is such a popular machine for industries like school systems, healthcare, warehousing, grocery, retail, entertainment and transportation. The XR offers 45% more scrubbing power than its competitors and has twin vacuum motors so you’ll have a clean and dry floor which means less safety hazards. XR is available with either the disk scrub head system that has a lower maintenance cost or the cylindrical scrub head that is perfect for cleaning grout lines, rubber floors and sweeping debris while scrubbing. A 7 hour run (36 volt, battery-operated) run time means you can clean in a single shift! Scrub Path Width (2x): 17", 20", and 23"
Dimensions (LxWxH): 69" x 36" x 56"
Scrub Path Width (2x): 32", 38", and 44"